Toronto-based mining company Dundee Precious Metals has overcome an important obstacle to its plans for a new open pit gold mine in southern Bulgaria. Bulgaria's Environment Minister Nona Karadzhova has finally signed the company's environment impact assessment for the mine near the town of Krumovgrad after returning it in the middle of October back to the chief environment council for reassessment. The council voted to preserve a clause, which allows the company to launch construction of the gold mining facilities whether or not the eco assessment is appealed. The Bulgarian cabinet gave on a 30-year concession the gold mine near the town of Krumovgrad to Dundee Precious Metals in February this year. The gold mine is located in the Krumovgrad municipality on lands of the villages of Guliya, Dazhdovnik, Zvanarka, Kaklitsa, Malko Kamnyane, Ovchari and Sarnak. In exchange for the 30-year concession, the company is making the commitment to invest over BGN 114 M and extract an average of 850 tons a year of ore. The Krumovgrad municipality is to receive 30% of the concession payments. In September, after examining the reports for the environment impact assessment for the mine, the chief environment council voted for giving the green light to the gold mine. The minister however has returned it for reassessment, citing the amendments to the law on environmental protection, which were adopted after the vote of the council. The minister acted on a request of Krumovgrad's mayor Sebihan Mehmed. The project to extract gold from the Krumovgrad mine has so far suffered many setbacks and court battles. In 2010, the Canadian company had to abandon plans for a gold mine near Bulgaria's Krumovgrad using cyanide technology after a Bulgarian court ruled against the cyanide gold extraction at the other mine operated by one Dundee's subsidiaries in the country, Chelopech Mining. The ruling came about after locals and environmentalists expressed concerns over the technology. The company plans to process the gold concentrate extracted in Bulgaria outside the country. At the beginning of 2010, the Toronto-based company acquired a smelter in Namibia, which could be used for the purpose. Dundee's new project about the Krumovgrad mine does not provide for the previously planned facility for extraction using cyanide, and will occupy a smaller area of the Ada Tepe deposit near the southern Bulgarian town. According to statements made in 2010 by Dundee officials, the project provides for a USD 100 M investment, which is less than the previous plans for investing USD 120-150 M including a cyanide installation. 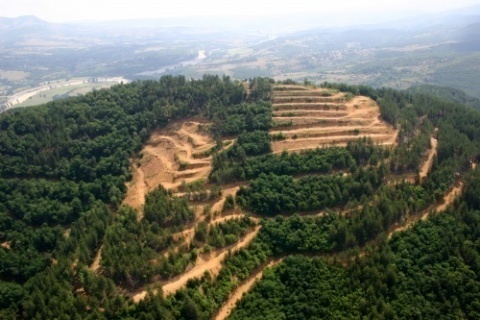 The Krumovgrad mine is expected to produce about 800 000-1 million tons of gold concentrate per year. Dundee Precious Metals Inc. is a Canadian based, international mining company engaged in the acquisition, exploration, development, mining and processing of precious metals properties.